The National e-Governance Plan (NeGP) of the Govt. of India aims to make all Government services accessible to the common man in his locality, through common service delivery outlets and ensure efficiency, transparency & reliability of such services at affordable costs to realize the basic needs of the common man. One of the goals of the Government to meet this vision is the need to cooperate, collaborate and integrate information across different departments in the Centre, States and Local Government. Government systems characterized by islands of legacy systems using heterogeneous platforms and technologies and spread across diverse geographical locations, in varying state of automation, make this task very challenging. The National e-Governance Service Delivery Gateway (NSDG), a MMP under the NeGP, can simplify this task by acting as a standards-based messaging switch and providing seamless interoperability and exchange of data across. The emergence of many e-governance applications for different departments to provide online services to citizens, businesses and government would require increasing interactions amongst departments and with external agencies at various levels in Government. 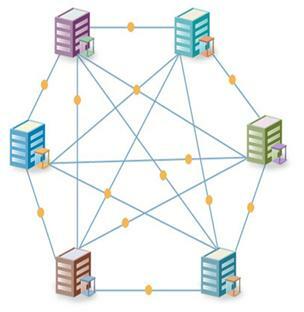 Departments would need to develop connectors/adaptors for point to point connections between departments creating a mesh as shown in figure and also tight coupling between applications. This would lead to applications difficult to maintain and upgrade in case of version change and change in government policies and business rules. 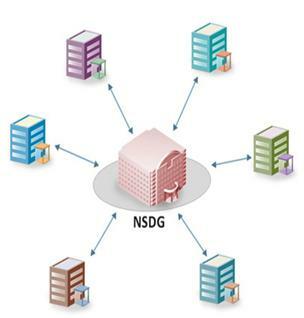 The National e-Governance Service Delivery Gateway (NSDG) is an attempt to reduce such point to point connections between departments and provide a standardized interfacing, messaging and routing switch through which various players such as departments, front-end service access providers and back-end service providers can make their applications and data inter-operable. The National e-Governance Service Delivery Gateway (NSDG) aims to achieve a high order of interoperability among autonomous and heterogeneous entities of the Government (in the Centre, States or Local bodies), based on a framework of e-Governance Standards. To act as a core infrastructure for achieving standards-based interoperability between various e-Government applications implemented at various levels and geographically dispersed locations. To evolve Gateway messaging standards and build a government owned Central Gateway based on these standards.